Bulls Back In Action Tomorrow? With the overnight rain expected to clear this morning, there are high hopes that Hereford United's game against Southport due to take place at Edgar Street tomorrow afternoon will go ahead. The Bulls are desperate to get the match on not only for the income it will produce but also for the players who haven't had a game since January 12th. And with the forecast predicting drier weather, there has to be every chance that 22 players will take to the pitch just before 3pm tomorrow. Former Bull Matt Done has joined Hibernian on loan from Barnsley til the end of the season. The 24 year old was taken to Barnsley by his former Rochdale boss Keith Hill but he has been on the sidelines with the Tykes struggling, making just six starts this season. Telford have wasted no time in finding a new manager, appointing Mark Cooper as their new boss just hours after sacking Andy Sinton. The former Darlington and Tamworth man's last Conference action was for Kettering as they fell apart last season. His appointment there lasted just one game. Former Bull Graham Hyde will remain with the club as Cooper's assistant. Southport have bolstered their ranks ahead of their trip to Edgar Street with the signing of defender Neil Byrne from Rochdale and midfielder Scott Kay from Huddersfield. Teenager Byrne had an unsuccessful trial with Tamworth last week, and makes the move with the Sandgrounders short of defensive options for Saturday's game. Steve Akrigg is having shoulder surgery today while Chris Lynch, Chris Lever, and Andy Parry are all out of the trip through injury. Midfielder Kay, 23, ended last season at Macclesfield, making 18 appearances before signing a season long deal at Huddersfield. Bulls midfielder Will Evans has left Edgar Street for Newport on loan for the rest of the season. The former Swindon trainee has played 19 times for the Bulls this term, and makes the move after the Exiles sold midfielder Lee Evans to Wolves earlier in the day. Evans, 21, is out of contract in the summer and joins ex-Bulls Byron Anthony and Tony James at Rodney Parade. Meanwhile, former Bulls loanee Phil Marsh has left Forest Green by mutual consent. The former Stalybridge man, 26, started only two games for the Gumpers after signing a two year deal in the summer. It has been announced that all fixtures on the final day of the Conference season will kick-off at 5.15pm so that one match can be screened live on Premier Sports. The pay-TV channel has announced it's latest set of televised fixtures, with the Bulls not featuring in any of the live dates, adding that the April 20th fixtures will all kick off late for them to cover one match. The Bulls travel to AFC Telford on that day. Telford have parted company with manager Andy Sinton. Former Bull Graham Hyde, who only joined the club last month, has been placed in temporary charge with the Bucks having not won a Conference match in 16 attempts. Bulls chairman David Keyte has told the Hereford Times that the club have rejected moves from Kidderminster and Wrexham for striker Ryan Bowman. Keyte also added that the board had put further funds into the club last week with postponements 'decimating' the cashflow at Edgar Street. The Bulls will play the twice-postponed home match with Mansfield on April 16th. The game will now be the final home match of the season three days after the home game with Gateshead, and ahead of a last-day trip to Telford on the 20th. Alfreton - In - Steven Hewitt (MF) from Burnley, loan to season end. Barrow - In - Lee McEvilly (FW) free agent. Cambridge - Out - James Jennings (DF) to Mansfield, free. Ebbsfleet - In - Josh Scott (FW) from Dagenham, month loan. Ebbsfleet - In - Josh Payne (FW) from Macclesfield, free. Ebbsfleet - In - Tobi Alabi (FW) from Millwall, month loan. Ebbsfleet - In - Adedamola Shitta (MF) from Millwall, month loan. Forest Green - Out - Phil Marsh (FW) released. Grimsby - In - Lenell John-Lewis (FW) from Bury, free. Hyde - In - Shay McCartan (FW) from Burnley, month loan. Kidderminster - In - Amari Morgan-Smith (FW) from Macclesfield, month loan. Kidderminster - In - Nat Jarvis (FW) from Cardiff, loan to season end. Luton - In - Steve McNulty (DF) from Fleetwood, free. Macclesfield - Out - Amari Morgan-Smith (FW) to Kidderminster, month loan. Macclesfield - Out - Josh Payne (FW) to Ebbsfleet, free. Macclesfield - Out - Arthur Gnahoua (FW) to Colwyn Bay, month loan. Macclesfield - Out - Junior Konadu (MF) to Chelmsford, month loan. Macclesfield - In - Rhys Taylor (GK) from Preston, free. Macclesfield - In - Darren Murphy (MF) from Port Vale, free. Macclesfield - In - Micah Evans (FW) from Blackburn, month loan. Macclesfield - In - Jonny Gorman (FW) from Wolves, month loan. Mansfield - In - James Jennings (DF) from Cambridge, free. Newport - Out - Lee Evans (MF) to Wolves, Undisclosed. Newport - In - Will Evans (MF) from Hereford, loan to season end. Newport - In - Scott Donnelly (MF) from Farnboro, free. Nuneaton - In - Aaron Phillips (DF) from Coventry, month loan. Southport - In - Neil Byrne (DF) from Rochdale, loan to season end. Southport - In - Scott Kay (MF) from Huddersfield, loan to season end. Stockport - In - Mark Cullen (FW) from Hull, month loan. Stockport - In - Jon Macken (FW) free agent. Stockport - In - Jake Fowler (FW) from Middlesboro, month loan. Wrexham - In - Chris Maxwell (GK) from Fleetwood, loan to season end. Gateshead have loaned defender Glenn Wilson to Salisbury for the rest of the season. The former Crawley man has started only five games this season since his summer move north. Barrow chairman Brian Keen has put out a call for fans to back the club, telling them they've been punching above their weight for several years. They host Luton this weekend, their first home league match of the year due to postponements. Football League clubs have a combined debt of £1billion, a report has revealed. Chairman Greg Clarke has warned that the current financial problems could continue for eight more years. Portsmouth's court case has been delayed for a third time. The hearing has now been delayed until February 14th, with the Administration of the club officially extended until mid-August. Alfreton have signed forward Scott Boden from Chesterfield on a month long loan deal. The 23 year old has made over 100 appearances for the Spireites, and had a loan with Mansfield last term. Kidderminster chairman Mark Serrell says any money earned by the club from their groundshare deal with Worcester will go into keeping the pitch up to scratch rather than being ploughed into their playing budget. Luton's FA Cup match with Millwall has been selected for live TV coverage, earning the Hatters a further £233,000 windfall. Wrexham have loaned young defender Steve Tomassen to Welsh League side Airbus for the rest of the season. The teenager spent the first half of the season with the Wingmakers. Chesterfield chairman Dave Allen says the club needs to cut it's £7million debt pile in half to be 'sustainable'. He has called on the local council to consider writing off a near £1million loan, while admitting that the club's IT system is costing it £100,000 a year to run. Luton boss Paul Buckle has been named Manager of the Month for January. Hyde have signed Blackburn youngsters Osayamen Osawe and Chris Dilo on loan for a month each. Dilo had a loan with the Manchester club earlier in the season. Oxford chairman Ian Lenagan says his family have put £865,000 into the club in the last six months to keep it running. Lower attendances at the club has seen them expecting losses of £450,000 this season with gates down by an average of 1,600. Wrexham keeper Joslain Mayebi has been given better news on his achilles injury, with the damage only being a partial tear. He will only miss four months rather than the previously expected eight. The Transfer Window closes at 11pm on Thursday night. Further movements in and out of Edgar Street are likely to depend on whether any clubs choose to make a move for some of the existing Bulls squad. With Harry Pell gone, speculation has continued through the month over the futures of Marley Watkins, Sam Clucas, and Ryan Bowman. The futures of some of the players still under costly Football League deals are also up in the air with the club currently keen to trim the wage bill. It is understood that at least one of those players has turned down a loan offer from a part-time side, while another has expressed a desire to return to League football. Once the window shuts the Bulls will not be able to sign any further loan players, but can sign free agents, for seven days afterwards. With just three months of the season remaining, any further loan signings after the loan window reopens will be able to complete the regular season and play-offs at Edgar Street within the normal 93 day limit on loans. This coming Friday the first Herefordshire Dignity Day Community Event is taking place at Hereford United's Starlite Rooms. A variety of subjects that will be presented which will all share the common themes of promoting Dignity and also supporting Carers in our workforce. Amidst the speakers are Falklands veteran Simon Weston OBE and well-known local businessman Clive Richards OBE. Also speaking will be Luke Graham, the Hereford United club captain. He will talk on the subject of 'Promoting Dignity Through Sport' in particular the 3D's campaign and how Dignity is promoted on and off the pitch. 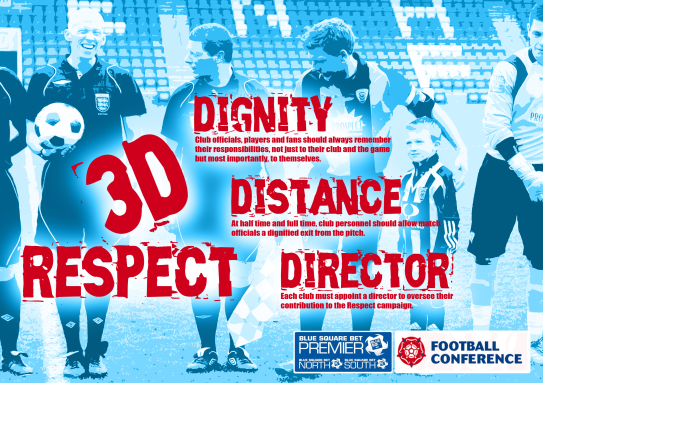 Blue Square Conference & Football Association promoting Dignity and Respect in football but runs across all sport. The Olympics provided an amazing opportunity for the whole country to be part of a celebration of all that is good in sport – unfortunately there is a huge amount of negative press linked to poor attitudes and behaviour within sport too – (recent examples – Lance Armstrong, Tiger Woods, John Terry & Rio Ferdinand). Many young people look up to their sporting heroes and mimic their behaviours. Sport can also save a lot of young people from a life that may not be so positive e.g. drink, drugs etc as they have a focus such as playing football. Team spirit is a vital part of this and a sense of belonging and accessibility to sport and leisure activities is really important. Wrexham keeper Joslain Mayebi has been ruled out for eight months after rupturing an achilles tendon during last night's draw with Southport. The Cameroonian played on after the injury as the Dragons had no sub keeper on the bench. Worcester have confirmed a groundshare at Kidderminster next season. The deal will last one season, with Worcester's Supporters Trust lodging a bid to build their own ground as an alternative to the stalled Nunnery Way development. Swindon are reported to be on the verge of a takeover led by Jed McCrory, who only bought into Banbury United four months ago along with former Port Vale chief Perry Deakin. York have released former Bull Danny Blanchett, with the one time loanee opting to join former club Cambridge City on non-contract terms. Luton have signed winger David Martin from Southend on an 18 month deal. The 27 year old has played in the Championship for Crystal Palace, Derby, and Millwall. Nuneaton have signed Luton midfielder James Dance and Coventry keeper Lee Burge on month long loan deals. Dance, 25, has made only one sub appearance this term, while Burge, 20, is yet to make his senior debut. James Musa is to stay with Hereford United for a second month after his loan deal was extended. The Fulham youngster has played in the last three Hereford games.